Raw, Local and from our very own bees! Debbie's parents, Ray and Barbara Diedel are Bee Keepers. Debbie herself has been keeping bees since 2014. 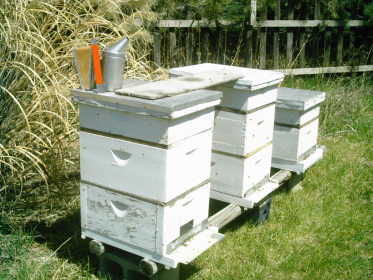 The bees feed on our gardens, orchard and native flowers and grasses for a beautiful honey with outstanding flavor. Honey can be purchased year round and is available Raw in the following sizes. Special ordering is available for gallon jars. We also have a few "infused" honey flavors in 16 oz containers @ $8.00 each. Java Honey is a coffee infused honey. We also have Hibiscus, Habanaro and Lavender infused honey. The 2 oz. mini bear is available in all our Honey flavors!